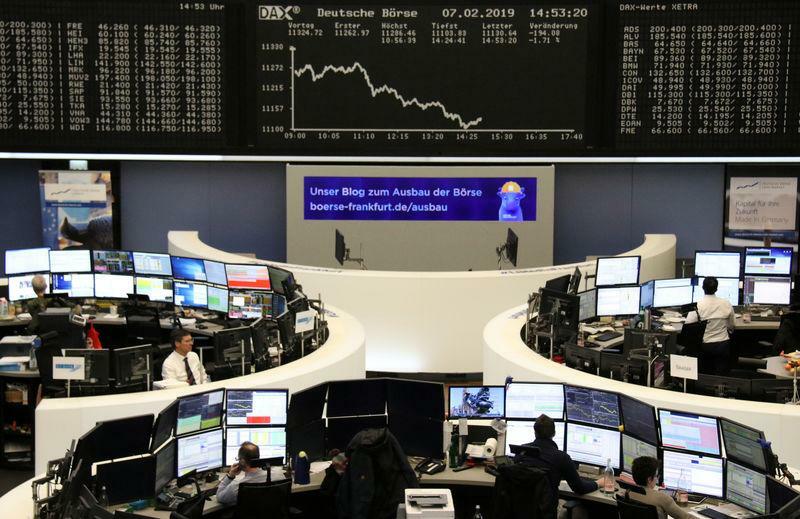 LONDON (Reuters) - European stocks slipped again on Friday and put an end to five straight weeks of gains as fears about an economic slowdown in the euro zone and a potential full-blown Sino/U.S. trade war added to disappointing earnings from blue chips. Losses deepened after Wall Street opened in the red, casting a further shadow over the rally that has been lifting markets since shortly after Christmas. The pan-European STOXX 600 lost 0.5 percent on the day and 0.4 percent on the week. 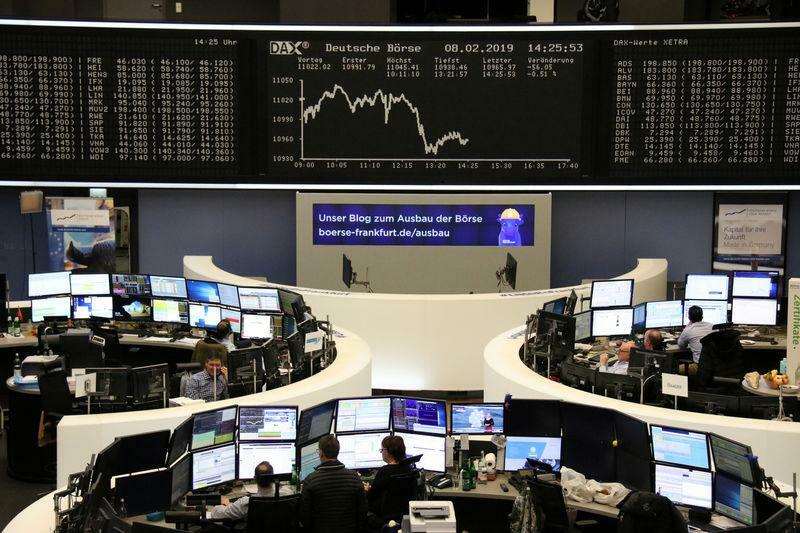 Germany's exporter-heavy DAX sustained heavy losses among regional bourses and retreated a little over 1 percent. Growth worries in Europe also increased after the European Commission downgraded its growth forecasts. Among disappointing trading updates was Belgium's Umicore, which lost 7.3 percent after saying it expected 2019 growth to be hit by subdued demand in cars and consumer electronics, and R&D costs. Analysts said the company's lack of quantitative guidance for 2019 weighed on sentiment. Trade-sensitive autos fell 2.2 percent, extending losses from Thursday, when the sector suffered its biggest one-day drop since the Brexit vote aftermath in June 2016. Tata Motors warned that Jaguar Land Rover would swing to a loss due to weak sales. That news demand weighed on auto suppliers Valeo and Faurecia, down 2.6 to 3.0 percent. Adding to the negativity around autos, German car wiring supplier Leoni sank 32 percent after delivering a significant miss to fourth-quarter earnings expectations. The Swiss business services company DKSH fell 7.5 percent, extending Thursday's losses after reporting earnings down 11 percent, below estimates. There were also positive surprises, however. Swedish electronics group Dometic topped the STOXX index with a 15.7 percent jump after giving a positive outlook for 2019 sales growth. French cosmetics giant L'Oreal said strong demand for luxury skin creams helped it beat fourth-quarter sales forecasts - another company reporting better-than-feared demand from China, after LVMH last week. "L’Oréal is capitalising on very strong skin care growth, booming Luxury markets, strong demand in Travel Retail channels and the shift to online," wrote Liberum analysts. Its shares rose just 1.25 percent, however; traders put the move down to profit-taking after a strong run to a record high on Feb 5. Luxury handbag maker Hermes gained 1.5 percent after it also said sales momentum in its Chinese stores remained stayed strong. Overall, Europe is on track for its weakest quarter for earnings growth in three years, but investors have been more forgiving to companies with low valuations and expectations at rock bottom. "The question now is what can provide the catalyst for another leg-up from here," said DNB's Harper. "At the moment, earnings revisions are not particularly encouraging."